Gary Butterfield and Kole Ross blow through Blaster Master. Watch Out for Fireballs Episode 112 is about the NES game Blaster Master. The episode was released on October 22, 2015. (00:00:17 - 00:04:55) Kole performs a dramatic reading of Chapter 20 of the Worlds of Power adaptation of Blaster Master. Gary notes that Blaster Master is a "2nd Tier" classic NES game. Not as beloved as Castlevania, Zelda or Mario but regarded more like Bionic Commando and Batman. This is a hybrid between a sidescroller and a top-down shooter. Kole adds that the success of Blaster Master led to more top-down games in a similar style which are less well regarded, such as Fester's Quest and Gremlins 2. Gary thinks that Gremlins 2 is actually pretty good, despite the common perception. He also thinks that the overhead shooting segments of Blaster Master are underrated, just not as good as the platforming parts. Kole agrees that the platforming segments where you play as the tank feel more satisfying, as it feels like you are making progress while playing them. The upgrades received throughout the game go towards the tank rather than the player character Jason, whose upgrades are incredibly fleeting. The combination of the two elements is handled more seamlessly than in other games like Bionic Commando where the top-down parts are separate stages, or Zelda 2 where the overworld isn't action-based. (More than an Overworld is Kole's favorite Journey song, except that More than a Feeling is actually a Boston song). The tank you control is named Sophia III (the name of the planet in the Japanese version). The tank is able to jump and drive on walls and ceilings later on. You add new abilities to the tank using upgrades that you get from bosses which you fight on foot as a boy named Jason who may as well be a trooper as in the original Japanese storyline. The tank has subweapons for taking out enemies that otherwise couldn't be hit, as in Castlevania. As you gain upgrades you are expected to backtrack to reach new areas with the tank's new capabilities. The game came with a map, so the player is expected to use one while playing the game. There aren't really secrets to find like in a Metroid game - it's a Metroidvania in a quite loose sense. You run into doors which are too small to enter as the tank, so Jason enters and kills bosses. Jason has a gun meter which increases his firepower as the player picks up powerups. However, as in Cave Story, when Jason gets hit by enemies, the gun meter goes down extremely quickly. Life refills are much more common than gun refills, so staying alive is much easier than having a lot of firepower. There is also a short-range grenade as a backup weapon. Kole feels that the system has a "rich get richer" element to it, as it's a lot easier to progress and power up the gun if you already have a high gun meter. On the other hand, Gary's main issue was that the field of view is so small that enemies will often hit Jason from off-screen, causing the gun meter to decrease quickly. It happens much more quickly than in Cave Story, and there are Medusa-like enemies often moving across the screen in waves. This exacerbates the difficulty of the bosses, which generally need a full gun meter to kill effectively. On the other hand, the game is merciful enough to give Jason and the tank separate health. The key developer of the game, Yoshiaki "Fanky" Iwata, set out to make the best game on the NES, in terms of play and graphics. Gary and Kole don't think it reached those heights, but it definitely is an excellent game with good production values, graphics and music. There was a direct sequel on the Sega Genesis, as well as followups on Playstation, Gameboy and WiiWare. In one of these sequels, the player character is the child of Jason and a character from the Worlds of Power book, so the novelization is strangely canon in the series, and the sequels follow from the Western version of the story and book. Most people are not aware of the sequels, and they are generally not as good as the original. Gary and Kole would both appreciate a new game in the series. Blaster Master: Blasting Again is 3D and looks similar to the Rare game Blast Corps, except even worse graphically. The story in the Japanese and American versions of the game are completely different. The Japanese plot is grandiose and involves various anime-esque sci-fi plot points. The American version is simplified in comparison and removes most of the anime tropes. Gary would like more this to be done to more things in general, and Kole anticipates that people from Something Awful are already rapelling in to disagree. The American version is a typical wacky video game plot, where a boy named Jason has a pet frog who jumps into a radioactive hole, leading Jason into a hidden world inside the Earth full of mutants, where he finds the tank Sophia III and a power suit. The antagonist is Plutonium Boss, which is sounds like something SWERY would come up with. In the Worlds of Power book there is a love interest too. The book involves a lot of shooting and jumping, which doesn't make for a good novel. Gary and Kole begin to go through the areas in the game. Each area has its own gimmick, some better than others. Unlike in a typical Metroidvania game, the game is broken up into numbered stages, even though backtracking is required and the numbers don't indicate linear progression as in a typical NES platformer. The game doesn't explain its nonlinearity as well as the "go left" moment at the beginning of Metroid. Stage 1 begins gently and with jaunty music. The tank's jumps feel bouncier than something like a Mario game, and this is well-animated. The tank can fire forward, or upwards, but not diagonally. Jason can get out of the tank at any point, but he is vulnerable and dies from fall damage easily. Early on a ladder leads to a top-down area that Jason enters on foot, which is fairly straightforward. Shooting all the time is key, as enemies come onto the screen all the time. Kole is amused by how harmless the spikes look, and compares the situation to John McClane being barefoot in Die Hard. The area contains just a cache of powerups, which is common for many of these areas - you want to gain more from going in than you lose. (Gary identifies with scavenging inside these little caves for weaponry while looking for a pet frog in this strange world. It's a universal struggle - Man vs Self, Man vs Food, Man vs Cave.) The jellyfish in this area are shamelessly similar to metroids, and some of the later enemies are floating heads which resemble an enemy from Final Fantasy IV. The boss of Area 1 is named Mother Brain, which is found inside one of the small caves. The bosses are similar to shooter bosses, but Jason isn't fast enough to dodge effectively, so he has to absorb a lot of damage. This boss can be hurt quite easily, but later bosses have a much smaller area of vulnerability and window of opportunity to attack. It's important to have a high amount of gun power for the bosses, and some of the middle levels of gun are almost useless because of firing in an arc. Kole is entertained by being able to see Gary writing down notes during the recording. Mother Brain is a brain squid surrounded by a sphere of brains, and is fairly simple to kill. For bosses in general, there is a glitch where using a grenade and pausing the game will cause it grenade to keep damaging the boss in the pause screen. For beating the boss you receive the "Hyper" upgrade which upgrades the tank gun and allows you to get past an enemy blocking Area 2. The second area has a medieval castle theme for some reason. Gary and Kole note that there is a lot of variety in the architecture and appearance of the areas. Gary's video game music cover band covered the music of this area. This area is full of small bug enemies which can't be hit by normal attacks, which is a trope of games of this era that Kole dislikes. You can kill them as Jason or use sub-weapons such as homing missiles, but these often get stuck orbiting the enemies and never hitting them. These enemies appear throughout the game, which happens a lot for various enemies and there isn't much sense of an eco-system like you expect in a Metroid game. The game starts being maze-like in Area 2 and some of the subsequent areas. The map comes in handy at this point. Gary is not much of a fan of mazes like this in 8-bit games because there aren't a lot of distinct landmarks. The purple lava which damages you starts to appear here. The overhead section is also more difficult than before, with more enemies and less powerups. The destructible blocks in this game reappear when they go off-screen, which Gary speculates is caused by lack of, or too much, object-permanence. The boss of the area is the Crabulous, which is not to be confused with the other crab bosses. Most of the bosses are just giant versions of animals, so Gary thinks they could have fallen into the radioactive pit that Jason's frog fell into. This boss is still fairly predictable, but the hitbox is much smaller. The reward from this boss is the "Crusher" upgrade which allows the tank gun to destroy blocks. This allows shortcuts to be used like the ones in Dark Souls. 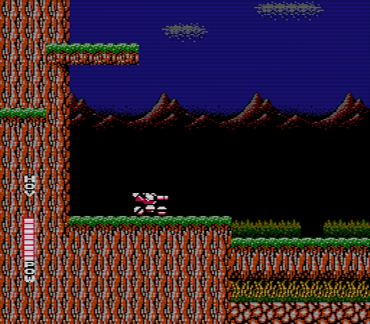 The third area of the game is technology-themed, which makes Kole remark that this may as well be Time Lord, and that it looks like the background of an R-Type level. The area introduces enemies that spray bombs around them, which becomes a common attack for enemies in this game. The area doesn't require much use of the Crusher upgrade, although it becomes more useful later in the game. Kole thinks it would have been nice if this area was more like Soma and that the technology in the stage would go haywire. The boss is named the Photophage, which means "light eater". This is metal. The named sword in Gary's book is named "Daydrinker", which Kole likes a lot and would be the name of Gary's sword if he ever had one. Gary doesn't really identify with the kind of guy with a sword on his wall, but Kole could probably talk him into it. The boss is a cube which teleports around and either creates decoys or splits into many independent versions of itself. This might be the last good boss in the game for Gary, as it has a good gimmick unlike the later ones and looks good. For beating the boss you get the "Hover" ability which is very limited by the hover resource which enemies drop. At this point you have to backtrack all the way to the first screen of the game and use the hover to climb up to the next area. Area 4 is the sewer which is another maze and everything looks the same. There are locked blocks which require you to collect a key. The overhead areas are difficult unless you know how to strafe by holding the grenade button. Kole was not aware of strafing for the whole game, which probably made the whole game harder than it would be otherwise. The overhead areas connect up but the right entrance needs to be found in the sidescrolling section, similar to how the Lost Woods dungeon works in A Link to the Past. The boss of the area is a frog, possibly Jason's pet frog, which makes that aspect of the story questionable. The frog can only be damaged when he opens his mouth and jumps up, so the correct timing needs to be used, but the timing needed to do damage requires a lot of precision. The boss drops the needed key, which requires Jason to climb out and over the level to reach the lock. Area 5 is a water level similar to Maridia from Super Metroid. Most of the level requires Jason to swim around as the tank can't. Gary and Kole both enjoyed this area as having to avoid most of the enemies made it much more tense than usual, in a similar way to the giant fish Ichthyosaur enemies in Half Life. Kole jokes that now he is deliberately referencing things, and Gary notes that generally games which have been covered on the show before won't be mentioned in the show notes, but the Ichthyosaur is an exception despite Half Life being covered. House of Leaves is also not included because of the many times Kole has mentioned it on various shows. The boss of the area is effectively halfway through the stage, since you gain the powerup which allows the tank to swim and explore the rest. The boss is a crab which is more difficult than the previous crab. With the highest gun level, the boss is easy as you can destroy all the boss's prejectiles and still damage it, but it is very difficult otherwise. Kole describes how he went into a "bullet-hell trance" as he didn't know the easier strategy. The boss drops the "Dive" ability which allows the tank to swim around and enter the next area. Area 6 is the ice level, where the tank and Jason both slide around. This is more frustrating in the overhead sections, as the ice is placed so that Jason slides into spikes and mines. There are also ice blocks which are used to create platforms by destroying them. The levels are becoming more linear at this point in the game, but also more difficult because of traversal being hindered. The boss is an ice version of a previous crab, which is just a more difficult version of the same thing. It reminds Kole that he once had to freeze crayfish at school, which they were able to survive. This boss drops the ability to climb walls, which is confusing to use because it often makes the player accidentally climb down the sides of platforms and fall into spikes. Gary and Kole would rather it was a toggle, but the NES doesn't have enough buttons. Area 7 is the fire level, with intense background music. Gary watched a speedrun where the music was sped up to be even faster. The stage requires a lot of carving out blocks in order to create paths to different areas. Those rooms are spaced out with linear paths full of enemies which didn't feel very well-designed to Gary and Kole. This also introduces enemies which launch towards the tank when they see it. The boss of the area is another frog, bringing into question whether Jason's pet is one of the frogs that he is killing. The powerup is "Wall 2" which allows the tank to drive on ceilings. The nature of floors, walls and ceilings is goofed about. The powerup is similarly tricky to the first Wall powerup. Getting into Area 8 requires riding along a ceiling, which Gary and Kole find is a more interesting use of the traversal powers than the rest of the game did. Area 8 is compared by Kole to the last stage of Contra, with "techno-organic intestines". The rooms are generally much more puzzle-based than previously, though some are combat-based. There is another area full of blocks, before the fight with the Plutonium Boss. Gary compares the design of the boss to diagrams of the female reproductive system, and Kole agrees. The boss spits out boulders/gallstones which must be shot so that they don't damage Jason. Gary admits that he did enjoy this boss after all, but the next boss, the Underworld Lord was another frustrating one. It is possible to exploit the boss by getting into an area that he can't attack. In the ending scene Jason has transformed into a grizzled soldier at the end of the game, and Freddy the pet frog is still alive. The sequels imply that Jason keeps the tank hidden in reserve until he has to have another adventure. Kole is glad to have done this game so that WOFF has included a variety types of NES platformers, including Contra and Little Nemo. Sunsoft usually appears on Abject Suffering, so it was nice to feature a better game from that company. Kole would also like to do a HAL NES platformer, but Gary would like to avoid doing another Kirby game as Kirby Super Star has already been covered. Kole and Gary both have affection for Sunsoft's Batman game and would like to cover it eventually. Gary mentiones that he rented Blaster Master as a kid and enjoyed it, but didn't get around to playing it again until his twenties. He thinks Little Nemo and Contra are probably both better than BM, but BM is still good, especially for its time and for what it pioneered. This episode was recorded in person as this was the weekend Gary and Kole were attending Portland Retro Gaming Expo.